Why wait till summer when April is packed with incredible cruises? John Wilmott lines up his top ten contenders. Easter this year falls in the middle of April – a great time to get away on a cruise. In Europe, temperatures are rising, the flowers are blooming and the crowds are yet to arrive – and you may catch a seasonal procession or ceremony. Elsewhere in the world, you can escape to more balmy climes while waiting for the British summer to arrive. You’ll be taking a chance with the weather, but spring can be a brilliant time to visit the Norwegian fjords. Crystal-clear air and a lack of other cruise ships will reward guests on Fred. Olsen’s trip from Southampton on Braemar. An elegant ship taking just over 900 guests in considerable comfort, with plenty of wood and brass and traditional afternoon tea, Braemar’s itinerary concentrates on the lesser-known southern fjords, with their soaring cliffs, waterfalls and picturesque villages. The handsome city of Bergen is also on the route, as is Flåm, noted for its mountain railway (a must for most visitors). From Eidfjord, a trip to the mighty Vøringsfossen waterfall is also highly recommended. On Good Friday you’ll be… cruising the breathtakingly narrow Nærøyfjord, listed by UNESCO for its beauty. On Easter Sunday you’ll be… cruising Lysefjord, best known for Pulpit Rock, a tiny plateau perched precariously above the water. 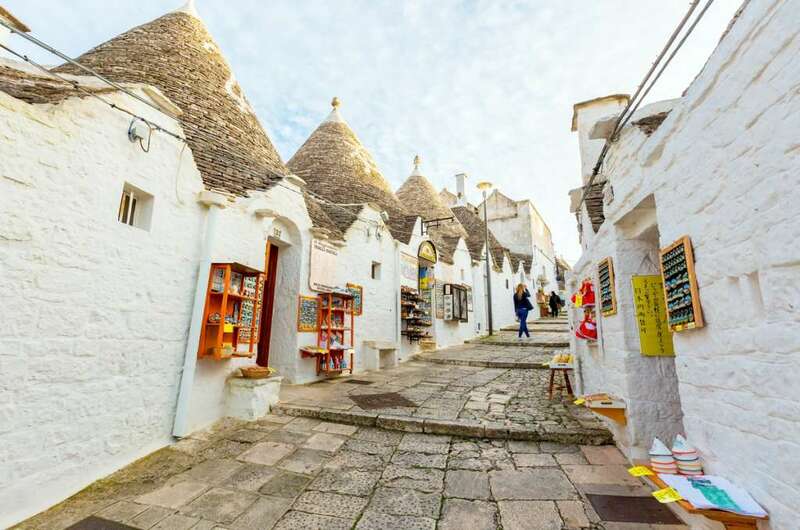 Shops and old traditional Trulli houses in the UNESCO world heritage site of Alberobello, Puglia, Italy. 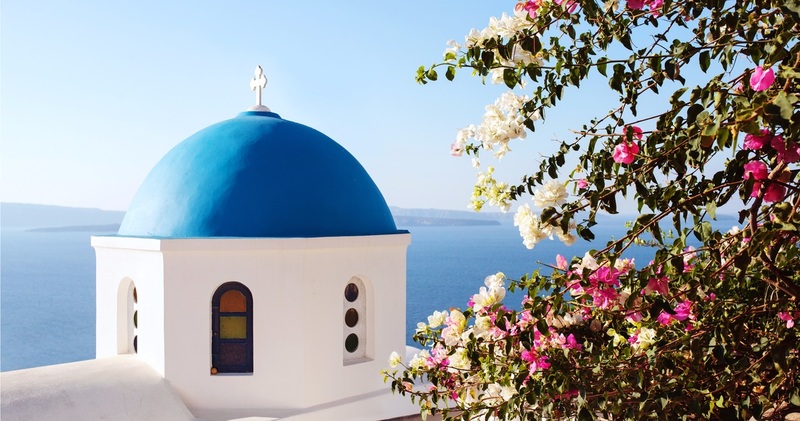 Costa Cruises has a good choice of Mediterranean departures in the spring. A round trip from Venice is a tempting proposition, as you may wish to spend a night or two in this most romantic of cities before or after your voyage. Costa neoClassica – a slightly older, mid-sized ship with excellent dining and two pools – sails south to Bari, a gateway to the architectural treasures of Puglia, then crosses to Greece. Dramatically volcanic Santorini and Classical Athens are on the list before arrival in Dubrovnik, where a trip on the cable car is recommended for a bird’s-eye view of this unsurpassed medieval walled city. On Good Friday you’ll be… watching the world-famous Venetian skyline recede from the top deck of your ship. On Easter Sunday you’ll be… in Corfu, exploring its charming old town, or perhaps taking a trip to the Achilleion Palace, built by the Empress of Austria. Saga Sapphire sets out from Southampton this Easter, on a four-night trip to northern France and the Channel Islands. First stop is Cherbourg, which has roots in Roman times but is today best known for its museums, basilica and aquarium. Another port is Le Havre, which has its own Notre Dame cathedral and old town, plus easy access to the enchanting and historic Normandy fishing town of Honfleur. Sapphire is a smaller ship with a friendly atmosphere, known for its caring crew – and its crazy golf course. On Good Friday you’ll be… out on deck, waving goodbye to the chilly grey skies over Southampton. On Easter Sunday you’ll be… in picturesque St Peter Port on Guernsey, noted for its seafood, with the possibility of a trip to the neighbouring isle of Sark. Far out in the Pacific, the Hawaiian islands are both truly exotic yet reassuringly familiar, being part of the USA. Princess Cruises’ round trip from San Francisco visits four of these alluring isles, starting with “Big Island”, known for its active volcanoes and botanic gardens. Kauai, another destination, is famed for its dramatic Waimea Canyon. You’ll be cruising aboard Grand Princess, a 2,600-passenger vessel with an outdoor movie screen, lavish entertainment and excellent kids’ clubs. On the return journey there’s a bonus call at Ensenada in Mexico, where you can hit the beach. On Good Friday you’ll be… in Honolulu, the islands’ capital, with its moving Pearl Harbor memorial and clifftop viewpoint. On Easter Sunday you’ll be… on Maui, known for its rainforest, waterfalls and whale watching. Let Holland America take you from the Pacific to the Atlantic, on its voyage from San Diego in southern California to Fort Lauderdale in Florida. MS Veendam – a mid-sized ship with an art and antiques collection and a sophisticated pool area – sails south to Puerto Vallarta in Mexico, which has nearly 30 miles of beaches, then hops along the coast to the volcanic landscapes of Guatemala, Nicaragua and Costa Rica. Passing through the Panama Canal between the oceans, there’s a call at Cartagena in Colombia – rich in UNESCO-listed architecture – and a chance to bask in the Bahamas before reaching the USA. On Good Friday you’ll be… checking out the diverse wildlife of Costa Rica. The port of Puerto Caldera is within reach of several national parks. On Easter Sunday you’ll be… gliding through the Panama Canal. It’s one of man’s greatest feats – but also look out for a natural spectacular in the form of colourful parrots. Easter is at the tail end of the main Caribbean season, but there’s still a decent selection of cruises around the islands and the coast of Mexico. You could embark at Miami on Norwegian Cruise Line’s Getaway for an itinerary that includes the newly formed resort of Harvest Caye in Belize, complete with jungle, reefs and various eco-activities. Also on the list are Roatan, an island off the coast of Honduras noted for its marine life, and Cozumel, the Mexican isle whose beaches are famously good (or you can take a Jeep tour inland). Getaway takes almost 4,000 passengers and is loaded with features such as the Illusionarium magic experience. A similar cruise operates on NCL’s Jade from Tampa. On Good Friday you’ll be… at Costa Maya, a purpose-built resort for cruise guests that’s close to amazing Mayan ruins. On Easter Sunday you’ll be… arriving in Miami with its famous Art Deco buildings, Latin flavour and exciting waterfront. Fancy flying to the sun when it’s still chilly at home, then sailing back just as Britain is warming up? P&O Cruises’ Dubai to Southampton voyage should be right up your street. Sailing aboard Arcadia, an adults-only mid-sized ship with many works of art and a Marco Pierre White restaurant, your first ports are Abu Dhabi, a blend of ancient and futuristic, and Khor al Fakkan, where you’ll find white-sand beaches. Making her way up the Red Sea and through the Suez Canal to Port Said, Arcadia cruises the Greek Islands, then heads to the mosques and bazaars of Istanbul. Malta is another welcome call, before stopping at lovely Lisbon on the way back to Southampton. 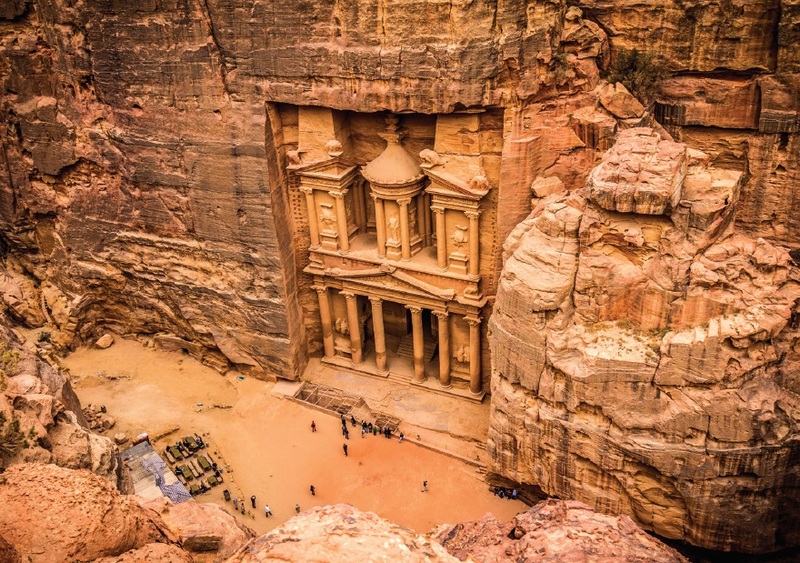 On Good Friday you’ll be… visiting Petra from the port of Aqaba in Jordan, marvelling at this ancient stone city. On Easter Sunday you’ll be… gliding though the Suez Canal across Egypt. 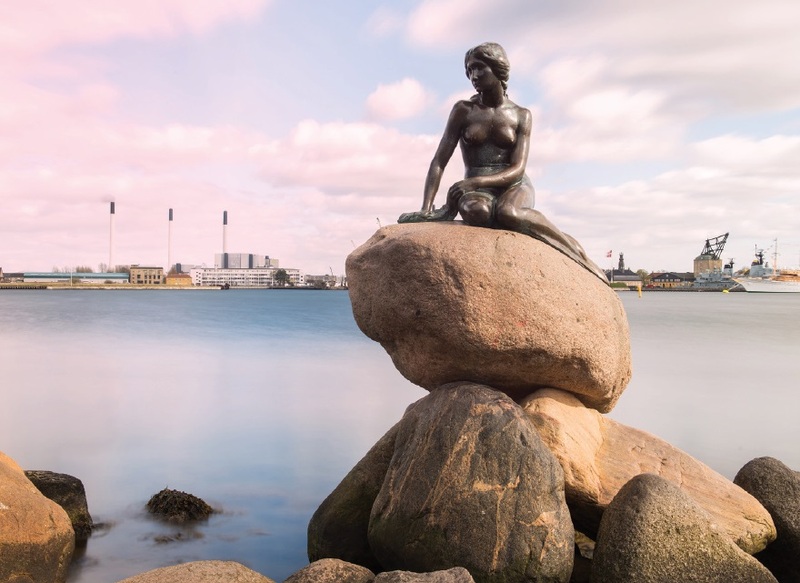 The historic cities around the Baltic Sea look especially appealing in the sharp light of April, but Swan Hellenic is one of the few cruise lines to take advantage. A diminutive, older-style ship with a country-house atmosphere and a free excursion programme, Minerva makes a round trip from Portsmouth through the Kiel Canal to Scandinavia and Russia. Karlskrona, set on a series of Swedish islands, is a fascinating destination, and then it’s on to Helsinki with its splendid cathedral. Klaipeda in Lithuania has an intriguing history, while a day in Copenhagen will be every bit as wonderful as you expect. And this being Swan Hellenic, distinguished guest speakers will be on board to help to bring each destination to life. On Good Friday you’ll be… admiring some of Russia’s greatest artistic and architectural treasures in noble St Petersburg, home to the world-famous Hermitage museum. On Easter Sunday you’ll be… wandering the streets of Tallinn, the ancient capital of Estonia, an exquisite small city crowded with colourful old buildings. It’s all-inclusive luxury all the way on Silversea’s journey around the west side of Italy and neighbouring destinations. Sailing aboard Silver Wind, an all-suite ship conveying fewer than 300 passengers, all of whom get butler service, you’ll set out from stylish Monte Carlo, head across to Livorno on the Italian coast, and then visit the beautiful islands of Corsica and Sardinia. A visit to Malta is sandwiched between calls at two different ports in Sicily, both with easy access to archaeological wonders. Next it’s off to the soaring Amalfi Coast and the clifftop town of Sorrento. The cruise also includes a stop at Civitavecchia (Rome). On Good Friday you’ll be… probably visiting Florence from Livorno, but do consider Pisa instead – there’s more than just the Leaning Tower. On Easter Sunday you’ll be… in Cagliari, Sardinia, with its impressive hilltop castle. Lush and dramatically volcanic, the Azores are an archipelago of Portuguese islands way out in the Atlantic. Noble Caledonia offers a detailed exploration of all nine islands from Serenissima, a classic ship with a raised viewing platform, that takes just 100 passengers. 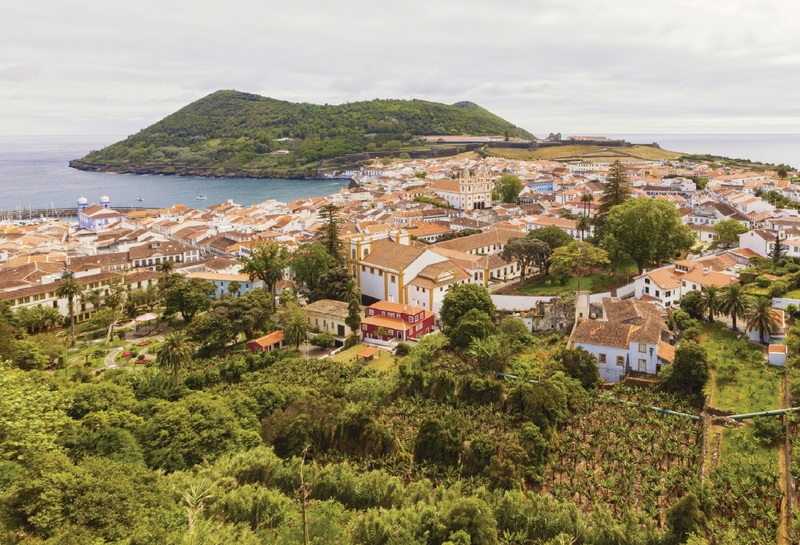 Your visits will include Sao Miguel, the largest island, known for its twin crater lakes; pretty Santa Maria; Terceira – with a UNESCO-listed town; Graciosa, with an unusual cave lake; super-steep Sao Jorge; and Faial, where recent volcanic activity has added new rock formations. Guests enjoy free excursions in each port. On Good Friday you’ll be… exploring Flores and Corvo, the remote westernmost isles, and enjoying their lush scenery. On Easter Sunday you’ll be… in Pico, dominated by a 7,000ft peak and remarkable for its lava flows and vineyards.